Since the last IEC our main national campaign was around the European and regional elections that were held simultaneously in June. Reports from Belgium and Greece presented to the 2004 meeting of the International Executive Committee (IEC) of the cwi, held in Belgium, 14 - 20 November. Almost one quarter of our present membership has been recruited since then, although very few directly from the election campaign. We have one new branch in the Walloon and one new branch in the Flanders area. We have made significant steps forward in the organising of working comrades doing trade union and political work at their workplace and/or in workers’ movement. We do school student work and student work, which still mainly consists of anti-racist and anti-fascist campaigning work, but also of struggles against cuts in education and general socialist propaganda. They work with a school student paper, which appears irregularly. In October we organised the first national congress of the ALS/EGA (Active Left Students) with 60 students present. As we now have branches of ALS/EGA at all major universities, we decided to try to form a national student leadership, to lead and coordinate the student work. A student body has been elected. 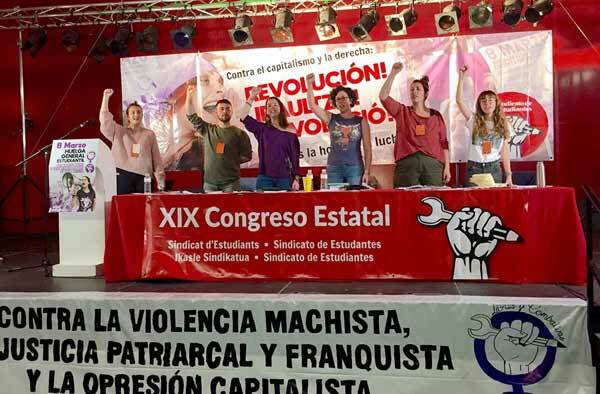 The student work is closely linked to the party, and the task of our student work is to strengthen the revolutionary party, and not just to build a "left current" at university level. We think that if struggle develops, the ALS/EGA will not be the first broad instrument which students will turn to. On the contrary, ALS/EGA would be the instrument with which we intervene in broader struggles at university level. As we concluded last year, the big challenge of the party is to build the same positions we now have amongst youth amongst the working class, especially in the workplaces. We switched an EC comrade from regional work to start organising this. In the trade union elections that took place a month before June’s political elections, different comrades got elected or re-elected. We organise regular national meetings of our postal workers, of our comrades working in the health sector and of our teachers. We also meet on a regular basis comrades in the railway company and with workers in the Brussels public transport (bus and tram) company. We have intervened in the struggle of postal workers, the ‘non-profit’ workers, and recent strikes of the tram and bus drivers in Brussels with specific to the sector orientated leaflets and we intervened in the demo of the DHL workers as well. Our leaflets have called for joint action of different sectors of workers in struggle, and also mention the youth march for jobs that we have initiated. We have not had a lot of experience in this area of work, due to a lull in working class movements in the ‘90s. This heavily weakened the conscious vanguard, but now that is starting to change. One of our big challenges is to make that reorientation to the working class movement with the whole of the party, especially now that we see more working class actions and movements developing. In fact, even our election campaign had the aim of preparing the party to become better known, as we said that would make it easier to intervene in the struggles that could start to develop from Autumn onwards. It is with that perspective that we took the initiative to propose to the youth organisations of the two biggest union federations (the Social Democratic ABVV-FGTB, the largest federation in Wallonia, and the Christian ACV-CSC, the largest Flemish federation) to call a new "march for jobs, not racism". This proposal was accepted and the march will take place on March 19th 2005. Although the union bureaucracies are trying to keep a firm control, and we have to be careful not be too closely linked to them, this march will give us a ticket to enter the workplaces. It will also make our orientation clear to our membership. The youth march "for jobs, free education and equality", as it is called officially, will be the main campaign for the whole of the organisation, and will be the unifying factor. Since the late 1990s, a growing though still small layer has started questioning the system as a whole. This results in us finding a bigger audience for our ideas. Although there is still a huge amount of confusion, socialist ideas have started to be discussed. Some people are really surprised to find a revolutionary socialist party actually building, commenting that they thought it was something which belonged in the past. They have anti-capitalist criticisms, but lack a model or alternative. But that alone is not enough. The revolutionary party has to have a sense of initiative to prepare the necessary steps to be able to intervene in the objective situation. Already before you could speak of an anti-racist movement, we had launched Blokbuster. The same happened with Internationaal Verzet (International Resistance/ISR) and the anti-globalisation movement, the anti-war movement and the building of anti-war committees, and now with the youth march. A constant question arises as to which instrument/campaign will be needed to intervene in the working class in a given situation. We prepare the party as a whole systematically. It is in a way easier in Belgium, because of the small size of the country, to get all branches and members on top of things. This is combined with the necessary attention to party building and working with targets on all fields. Setting and checking targets must be our guide for action. It gives an idea of what can be reached if all members are involved. It teaches members to do political work with a clear and conscious goal. We organise our treasurers, paper organisers, comrades responsible for recruitment etc. in national commissions, who come together on a three monthly basis. As we have already explained with the example of our student work, the political activity of our members has to strengthen the revolutionary party. That is not in contradiction with always trying to develop the movement in its broad sense, but it should go hand in hand, as the revolutionary party will win credit and authority. A national recruitment/consolidation committee has been set up in the organisation, and played a role in the election campaign. This is still, however, in its early stages and has to be developed further. On the National Committee we have developed a new cadre by searching for a way of getting a bigger participation of NC members. We had a system (which did not work all the time) in which EC members prepared NC members to do lead-offs at NC meetings and an EC member did the summing up. At EC level, we involved students who could work for a temporary period as a FT for the party. But there are limits. The NC will slowly lose its character of an "educator" and will be made up only of leading comrades, at least for its Flemish component. At the level of the French-speaking areas, a leadership is still evolving. A bureau has been formed in Brussels to develop a collective local leadership. Also in Liege, we went to forming a separate branch in Verviers (an area close to Liege that was previously integrated in Liege) and more recently also towards two branches in Liege itself. Another element which played a role in the development of new cadres was the role of the women’s commission. It has the task of developing new women members who join the party and encouraging them to take up tasks and responsibilities in building the branches. It meets every two to three months and brings together 20 to 30 comrades. In the last half year, we were asked three times to appear on national television (not always in the name of the party, but via ALS), every time on issues concerning women - woman and the media, the "babe" culture and the issue of the legalisation of prostitution. The next months will be crucial months for us, as we are going to "invest" in the building of our apparatus to make further growth possible. We are going to raise our international subs and part of this increase has already been implemented in the last two quarters of 2004. Our targets can be realised only if we raise financial consciousness even further, but also quite substantially by a change in the social composition through recruiting more workers. The fighting fund collection is important to fill the gap between our monthly structural income (subs) and monthly structural expenses (apparatus). The target for FF is going up from 6,500 to 8,500 euros a quarter. We will have to fight for these targets. Realising them will not be easy, but they are perfectly possible. We are convinced that the youth march will give us the necessary echo in society to be able to realise our short-term goals. Growth of the CWI in Greece has been steady. Nearly half our members are female and about 20% are immigrants. Our paper - Xekinima - comes out strictly once every month and the School Student Xekinima is selling well. Matchete - the photocopied university student journal, produced locally, in different cities and universities has had at least 4 different editions.. The first half of 2004 was dominated by the Olympic Games, particularly after the March general election that New Democracy won and PASOK lost. There was an agreement between the government and the unions for peace on the industrial front in order to be able to complete the works for the Olympics. On the other hand the government was going through a grace period - after so many years of PASOK government Also, it avoided any attacks, concentrating on being able to prepare the Olympics so as not to be exposed internationally. This situation was predictable from the beginning. We did not expect any serious developments on the class struggle front or any movements in general until after the Olympics were over - from Autumn onwards. From the point of view of campaigns the main campaigns during the first half were the student elections in the spring, an anti-racist demo (proposed by us and organized by the social forum and the campaign for Nigeria (with the visit of Segun from the CWI Nigeria section). The antiwar demos did not attract large numbers. There were a few demos against the Olympics which we had a presence in. June and July were fully devoted to the campaign for the Youth Against Racism Summer camp. On the political front the main developments had to do with elections and the crisis of the parties and organizations of the left. The general election took place in March and the euro elections in June. We took a general position of "vote left parties". These tactical decisions were vindicated by events. Soon after the elections the vast majority of the rest of the parties and organizations of the left, with the sole exception of the CP, went into crisis. They either went into a period of stalemate, stagnation, and search for identity and role, or went into vicious internal faction fights. The extent of this crisis was such that we ourselves were surprised; it proved the incapacity of these organizations to take advantage of a big movement like the one we had through 2003. Though objectively the situation did not provide any particular opportunities, the generalized crisis of the left filled our organization with a very high morale and confidence in the correctness of our ideas, our general method and our tactics. In Salonica we set up a "growth committee" - a group of young comrades working since the end of last year, in preparation for the full-timer’s departure to the army. It did a fantastic job. They not only maintained the work but built our forces in Salonica. At the same time we began to plan an intervention in Cyprus after last year’s tumultuous events (opening of the border, etc). This was postponed once; it had to be delayed until after the referendum when Greek Cypriots voted against a plan by the UN for a compromise "solution". We sent a comrade from May onwards to start a campaign for the building of a broad "Youth against Nationalism in Cyprus" with the initial aim of getting a group of youth to the Greek YRE camp. Both the camp and our intervention in Cyprus were very successful. There were 244 present at the camp. This year was the first time we had complete "self organization" ie we organized everything ourselves, from morning breakfast to evening meals, music, sports, etc. Gross revenues were over 14,000 euros (‘net’ over 11 000 euros). The biggest number ever of youth agreed to join - either as members or as observers. It was the most successful camp up to now, despite a small drop in the numbers present, due to the Olympics. Summer holidays were postponed which meant that worker comrades could not come, and many youth were tempted to make a little bit of money by taking temporary jobs. By far the most important success at the camp (and of the whole year) was the recruitment of a group of Cypriot youth who came to the camp after our successful campaign on the island. In Cyprus they had agreed to join Youth Against Nationalism, but they would not join the CWI. At the end, having seen the CWI in practice, having had many discussions individually and as a group, they were inspired by the ideas, and they made up their mind to join. A visit was organized to Cyprus, in September, in order to see how the group held, and in order to make plans for the future. The central proposal to the new young comrades, was to continue working under the name of "youth against nationalism" but to change its character. Instead of a broad youth organization, it would become the CWI youth organization with a socialist programme. There was unanimous agreement on this. There was also agreement on the production of a youth paper, called, "The Wall". A number of leaflets have already been produced by the comrades, and distributed. They have also opened a page on the internet and they have a column on the web site of the Greek organization. The older comrades in Cyprus have been rejuvenated.and some of them reactivated. There is a joint committee of two youth and two older comrades. This Autumn started with the biggest number of activities organized on an area basis by the organization since the beginning of the ‘90’s. Nearly every area in Athens went for public activities, like small local festivals (a tradition in Greece), youth concerts or large public meetings (campaigned for with posters and leaflets) directed mainly to the youth. Taking into consideration the new objective situation that we expected to develop after the end of the Olympics (rise in unemployment, rise in the budget deficit and the national debt, a new austerity policy by the ND govt) we decided to direct more attention to trade union work. In the NC meeting of last September we went ahead with the setting up of a trade union committee to follow more closely the developments on the t.u. front, to assist with the production of leaflets, the mobilization of the organization to intervene in strikes, rallies etc. The most important trade union work remains our work in the health sector. We have been able to keep the position of president of one of the biggest hospitals in Athens (about 1,500 workers) for nearly two years. In all this period however, there has been a continuous battle inside the union group that we set up, against the attempts of the CP to sabotage the work, undermine us and split the group. It now seems that a split is inevitable. We cannot have a precise idea of the impact of the split on the workers, especially as about 1/3 of the support our union fraction received came from CP supporters. It is possible that we may loose the position of the president, as a result of this, or that we may even choose to leave it, as it absorbs too much energy away from building our forces and expanding our work to other hospitals. We are now in the process of producing a health sector bulletin which is going to be very useful for our work, since there is no other trade union bulletin in the health sector. The main thing is to get the membership target by the end of the year. We are now one of the 5 or 6 best known organizations in the Greek left. Last year’s growth lead us into the top 10. But this year’s crisis of the rest of the left and the successful consolidation of our forces has pushed us even higher. Competition is still severe but the organization is beginning to picture itself leaving behind the rest of the far left, gaining a clear lead that will open the way to new leaps forward. In one city, Volos, our only opponent now is the CP; we have left far behind all other organizations of the left. In a desperate move on their part during last April, around the time of the student elections, they produced 3 leaflets in a period of 6 weeks directed solely against us! This was the biggest number of leaflets they ever produced and, instead of dealing with issues affecting society, education etc, they attacked (i.e. slandered) us! If we are able to double our forces within the next two years in Volos and Salonica, which is our target, we will have stood out from the rest of the left to provide a direct challenge to the CP. This is the strategy we are already working on. Once achieved it will be of crucial significance for the general work in Greece. Athens is lagging behind the city is huge and the rest of the left are mainly concentrated here. Over the next few months we are planning quite an intensive activity on the immigrant front too. We are proposing to the Social Forum a common rally for immigrant rights in January and we plan our own independent campaign. We will organise two pickets, each of around 100 people, outside government offices in November and December. The African branch is doing well, but there are difficulties with the Asian branch. Our few Albanian members seem quite consolidated and we have been able to develop quite wide support among Albanian building workers. We are looking forward to a new phase of growth and of development of the CWI in Greece.